I am curious for those with low density hair, what are some of the challenges you have with low density and how do you deal with it. My right side is far less dense than my left (while the left feels toasty outside, I feel breeze on my right). Even before I embraced my curls, my right has always been an issue. It has a tendency to be unruly, uncooperative, and just looks like a hot mess compared to the other side. 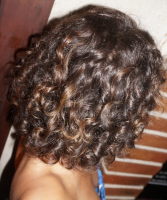 With curly hair, the left has less curl definition, less clumping, and tends to look like a tangled mess. I am wondering if this could be because of the density difference and looking for either confirmation or suggestions on it being another issue. Thanks ladies! Right Side - same product and routine as left, very different results! Today is especially bad, hence why I have decided to finally figure this issue out. Girl! There is just not enough help out there for people like us! Tbh I'm still working on a true solution. I have low density with fine hair. The hair on the top and front of my head is full. The hair on the sides are okay as well. 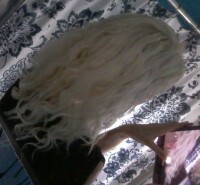 However, the back is so thin compared to the rest of my hair and it is so frustrating! Sometimes, when I want to wear my hair down, I really dislike the way it looks. The front looks full while the back looks whispy. So I end up wearing it up. smh. The only solutions I have atm are allowing my hair to shrink up a little, but I have 4a hair type. Somehow that helps balance out some of the contrast between the front and back of my hair. It helps my hair look more uniform, but it also everything look shorter (esp. the back). Also, who wants to wear a headband everyday!? It's hard for me because I feel like usually people have high density coarse hair or low density fine hair. But I think I have a lower density of coarse hair. Now that is a real challenge. I have the same issue. I have fine hair, and low density on the top/back of my head. It's really noticeable sometimes when my hair is parted on the side and especially when I'm trying to do half up/half down styles. I have a couple of cowlicks in the back of my head also which really makes things worse because sometimes it literally looks like I'm missing chunks of hair. I've found that picking my hair out a little more in these areas has sort of helped to even things out, but sometimes this just makes that area look more frizzy with less curl definition, so it's still a noticeable difference. Thanks for all the insight, ladies! My hair is in fact finer on the low dense side. My back is pretty bad as well. I have to check every day that I don't have any "bald spots" showing. In the words of Roald Dahl ".... a hopeful and comforting message: You are not alone.” Seriously, that's the best part of curly communities. Knowing others deal with same issues makes them a lot less frustrating. @guineapigsrcute ; interesting observation! Now that I think about it, fine/low dense usually do come hand in hand! Just shows you, you can't blanket characterize curly hair! @cnic216 - totally get feeling like you are missing chunks of hair! 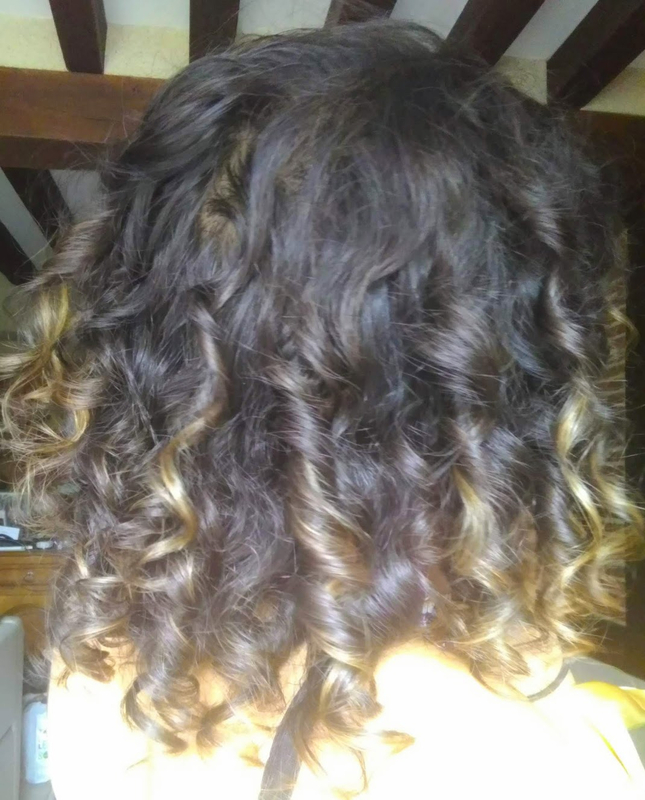 I actually stopped trying to get fat clumps out of my curls because I found it made it harder to cover up the "bald spot" on the back of my hair. I've been doing something similar. I pick out chunks that stand out,and one by one, re-wet and diffuse. It's a constant battle for me, and my paranoia about the thin spots knows no bounds - I don't even like people behind me on an escalator or in a theatre! Mine's thin on top so even with layers I tend to have a bit of a pyramid going on, I used to do a half up/half down style (before the thinning) and thought maybe I could revisit that but I now don't have enough density to even make that work - the lengths just look straggly. 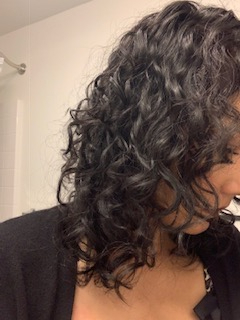 I no longer try to get good clumping as I get that bald spot thing happening, so thinner curls are better for me, I also don't try to get rid of every scrap of frizz (impossible task anyway!) as the frizz gives me a bit of volume. I use a fine tooth comb to bring together the hair on the top of my head around my part - which I swap around every now and then as changing it up helps somehow. I also put my fingers up into my hair when it's dry and gently rub my scalp, which helps hide the thinning a bit. Only so much you can do, sadly. 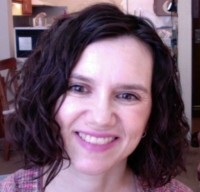 So yesterday, I admittedly used only half the gel I typically use, which i think was a cause to the really bad hair day. wearing a purse on one side and accidentally breaking off hair. or in my case, detangling one side first then when I get to the other side, it is more dry and prone to breakage. @BrittanyM ; I actually thought about that. Though I am an active sleeper who sleeps on both sides, back, and stomach, I think I do favor my less dense side. I have the same issue but in the back of my head only (I feel like i have less hair at this level and less definition too.. we can see more easily my scalp .. ) but on the front and sides it's ok. . I just created an Instagram account on the evolution of my curly hair journey ! @socurls oh my! those are some beautiful ringlet curls! Does it dry naturally like that or do you do something to force it to ringlet like that? I have the exact same spot on the back of my head. I spread the hair at my crown over it while it's still wet. After a while, my hair learned that shape, kind of like parting, so I don't have to work so hard to cover it any more. @tinksaysboo I do the exact same thing. Although, my hair hasn't learned to do it on its own yet! For the definition of your curls you can perhaps use the finger coiling method or rake and shake to have the same curls on the sides ? 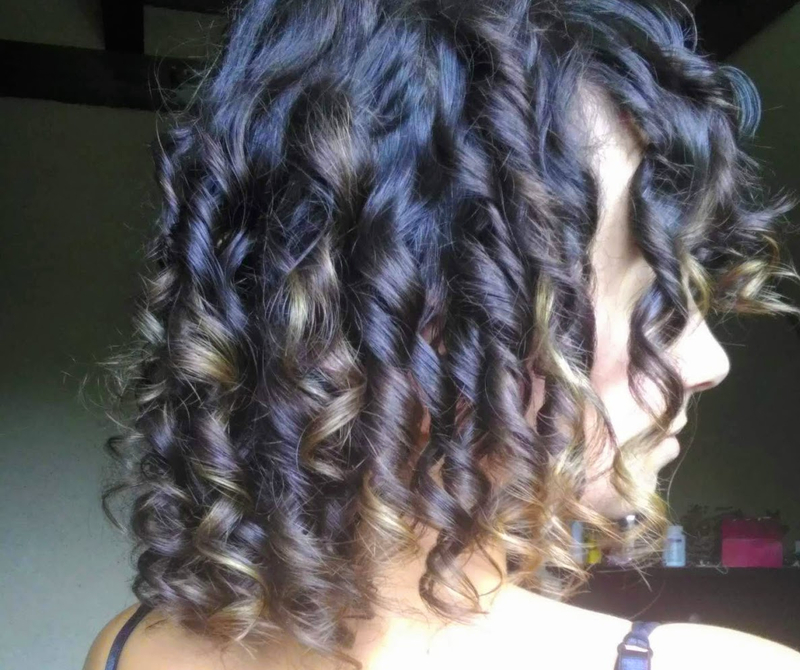 I have actually been able to get similar ringlets with finger coiling. But they leave more of my scalp showing and a little harder to refresh. I recently won some of those ringlet maker no-heat rollers. I've been having really good hair lately, so going to wait to use them. I feel like if I do I will lose my good hair streak haha. I have some low-density areas also. 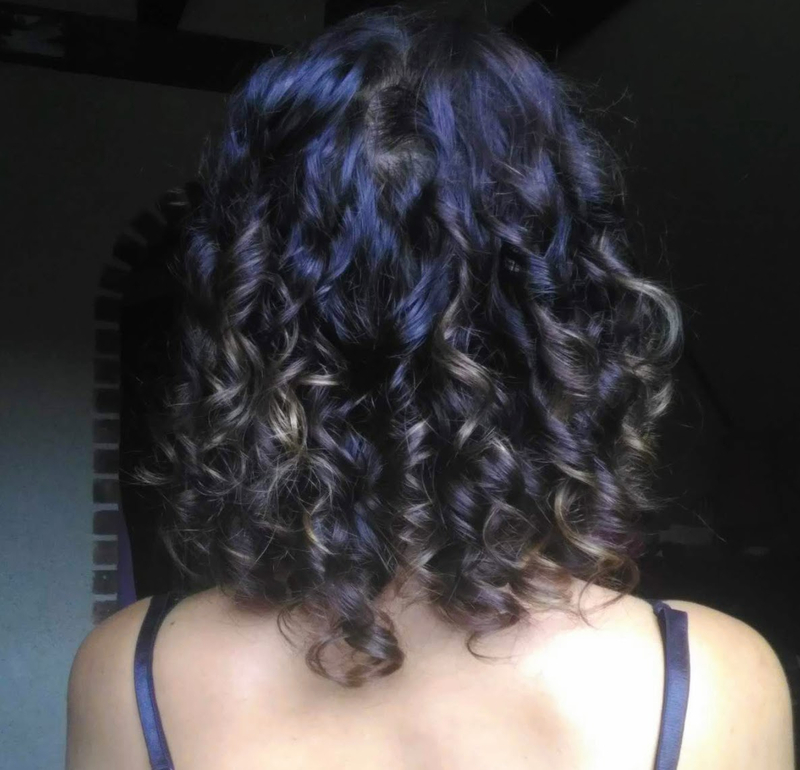 I've always had difficulty getting my sides to curl as well as the rest of my head, and my styist told me that it's because my sides are less dense than the rest of my head and are also a looser curl pattern. So @tinksaysboo, your hair on the right side might also be a looser curl pattern. I have issues with apparent bald spots showing too. I think it is especially difficult for people with dark, fine hair and light skin. It seems that you're always going to see some scalp just because of the way curls clump. What helps me is to run a fine-tooth comb through my hair after I've applied my leave-in. That gets rid of any crazy clumping and allows me to create "new" clumps when I scrunch in my gel. You just have to make sure your hair is really wet, though, or else it's hard to get the clumps back. I also will check my hair when it's close to 100% dry to see if there are any bald spots (by using a handheld mirror), and if there are, I clip the hair from either side together to close up the bald spot and let the hair finish drying. That usually works. 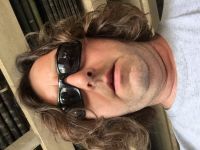 The main help for my low-density parts comes from being really light-handed with conditioner and adding extra hard-hold gel (or other hard-hold product or texturizer spray, like sea salt spray) to that section. Regardless, I usually end up having to put my hair behind my ears because it just doesn't look as good as the rest of my head. 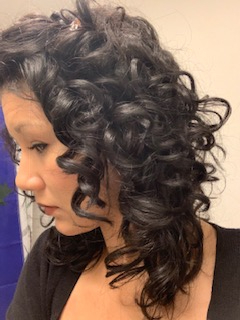 I will occasionally use the curling iron to touch up the low-density parts if I really don't want to tuck my hair behind my ears. I have the same problem. My hair dresser suggested I put some of the high density hair and flip it to the lower density side. It does make a different. Update: I've started finger coiling just the right side of my hair and that has been doing the trick!